Wool Ruana Shawl Kerry Woollen Mills Kelly Green Irish Made | What Should I Say? This beautiful Irish accessory is worn like a shawl, wrap or cape and known as a ruana or ruana wrap. These ruanas for women can be worn to go out and about on the town or used to cozy up on the couch with a good book! This fabulous ruana wrap features a deep mountain blue that will look wonderful with denims or black! 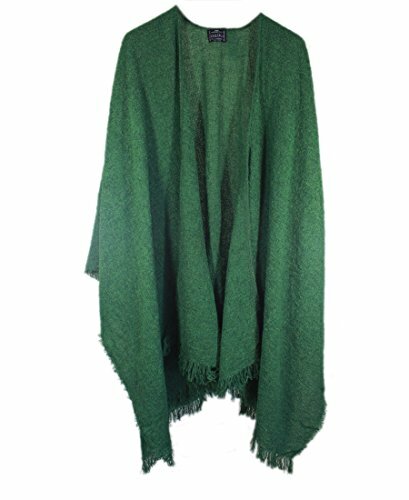 Made of 85% Irish lambswool and 15% nylon, the one-size fits most shawl is super soft and durable for years to come. Ruana wraps are woven from superfine Irish lambswool and are lightweight, soft and warm. The ruana measures approximately 54" by 72". The ruana wrap is crafted in Co. Kerry, Ireland by Kerry Woollen Mills, one of the last surviving woolen mills in the Kerry countryside that was established over 300 years ago. Sport this flowing ruana wrap all year long for a comfortable Irish accessory. A kelly green ruana wrap great for any occasion. Irish ruana measures 54" by 72". Shawl wrap is made of 85% lambswool and 15% nylon making it soft and long lasting. Irish Made Product by Kerry Woolen Mills in County Kerry, Ireland who have been producing wool since the 17th Century! If you have any questions about this product by Kerry Woollen Mills, contact us by completing and submitting the form below. If you are looking for a specif part number, please include it with your message.